Our last stop at the Imagtioons Zoo Aquarium brings us to the largest aquatic creature at the zoo - the optipluralis (op-ta-plur-al-us) whale. Its most distinct feature is of course its size. What most people notice next is its distinct tail shape. The large fan like tail enables the optipluralis whale to swim quite fast for its size. 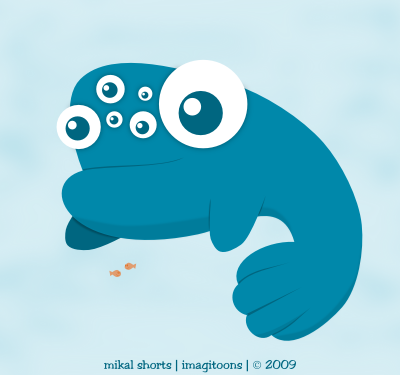 The feature most people miss, and the feature for which the whale's name is derived, is its multiple eyes. The optiplralis whale's eyes can act together to help the whale see for long distances, or they can work seperately to help the whale see most of its surroundings. The optipluralis whale is pretty rare to see in the wild and we're even one of the few zoos to have one of these wonderful creatures! Well kiddos, that wraps up our walk through the Aquarium - now it's time to go see the Land Mammals exhibit! See ya back here Monday! This is surprisingly detailed... I really wasn't expecting to see this many animals with cool information. Yeah, I figured there's usually info about the animals at the *normal* zoo...so why not the Imagitoons Zoo?? ?